The Man In Black Goes To The County Fair Working as a DJ at his local radio station in 1981, NPR's Don Gonyea snagged the interview of a lifetime. Johnny Cash stopped to answer questions before taking the stage at the Monroe County Fair in Michigan. 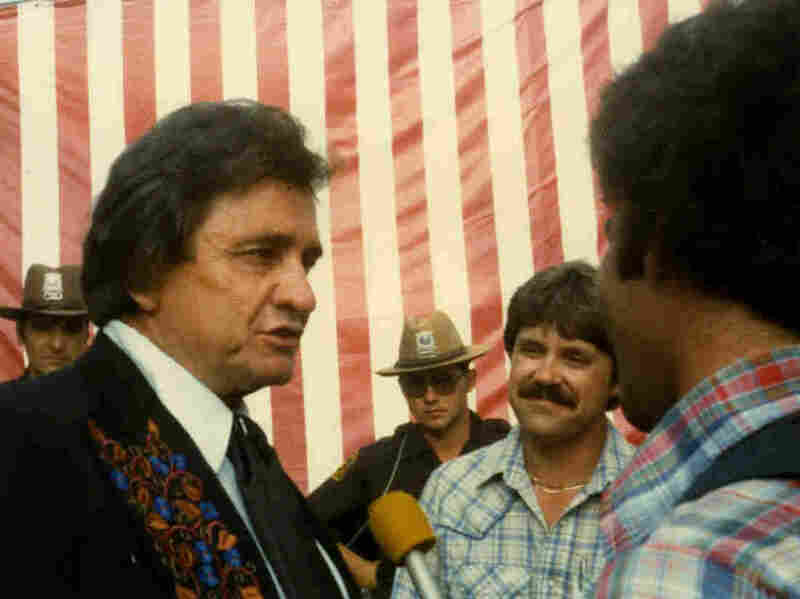 Don Gonyea (far right, in vest) interviewing Johnny Cash in 1981. I started out in radio more than 30 years ago. My first job right out of college was as a country-western DJ at WVMO, my hometown radio station in Monroe, Mich. I have many boxes of cassette tapes stashed in my basement, including one that has a recording from the Monroe County Fair in the summer of 1981. I remember standing there with my microphone. To my right were the grandstands where they do the demolition derby. To my left was this big, silver tour bus. I was about to meet one of my musical heroes: Johnny Cash. When I found out Johnny Cash was coming to the county fair, I tried to line up an interview, but I didn't receive any response. I tried again. Nothing. Finally, a guy who worked at the fair said, "If you stand here at this railing, his tour bus is there, the stage is there. Maybe as he walks past, he'll stop and talk to you." And he did. I asked him a few questions about his new album, The Baron. But I arrived at the fair that day not knowing if he'd stop to talk to us, so I didn't have a big list of questions ready. He kept talking and he kept standing there, even though I kept expecting him to walk away. So, after a while, I raised what I didn't realize at the time was kind of a sore spot: Country music was becoming more pop, less pure country. "It's really nothing new," Cash said. "I did that 24 years ago with 'I Walk the Line.' It seems as if the record companies are trying for a 'crossover hit.' That's not what country music is all about to me. Generally, when I'm in charge of the production of my records, I try to record the best Johnny Cash song I can find and do it in a way that's comfortable for me. Hopefully the people will like it. Usually, they're unadorned and not overproduced." Five, six, seven minutes passed and I was out of questions. So I asked him, "How'd you get to be The Man in Black?" I cringe a little bit when I hear myself ask that question, but you've got to love his answer. 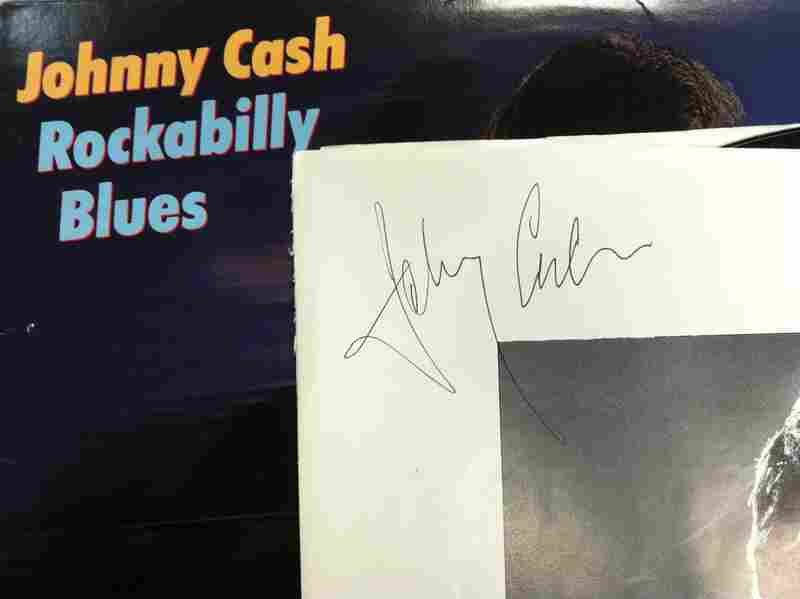 Gonyea's copy of Johnny Cash's Rockabilly Blues, signed by the man himself. "For one reason, it's a little more slimming," Cash said. "I wrote a song called 'Man in Black' in about 1970. In the song, you see where I pointed out some of the problems and the ills that we have in this country. But I point to myself as being one of those people responsible for correcting some of those problems and unfortunate things that happen to people here." Eventually, he had to wrap it up and head to the stage because he had a show to do. But just before he did that, I ceased being this accidental journalist and I let myself be a fan. I brought the album sleeve from one of his recent LPs with me and I asked him if he'd sign it. I still have that signature.